This post might not be as helpful now as it would have been a year ago due to this improvement. Now Yammer DirSync could be used by organizations requiring Yammer SSO, previously it was used by each organization wanting to sync users from on-premise Active Directory to the Yammer network. More info on how to implement Yammer SSO, which is a different scenario can be found here. I won't be trying to reinvent the wheel in this post, as there are plenty of good information sources on the Yammer DirSync implementation itself, like this one, but I'd rather share the limitations and issues I've faced when I had to meet a requirement to implement sophisticated filtering for the synchronization process. The requirement seemed quite simple at a first sight - the customer wanted to synchronize users only from 5 specific OUs in their on-premise Active Directory domain. 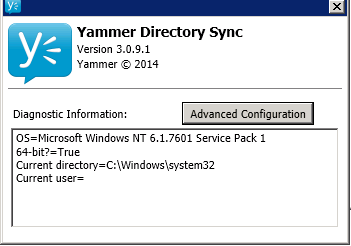 Yammer DirSync (as well as the SharePoint User Profile Service) synchronization allows the use of LDAP queries. If you're new to those, you can read more about their syntax here. The bad thing is, you have no option to query for a specific OU - and hence - no visible option to meet this requirement. The good thing is, there is a more advanced option to do this - partly a configuration cheat and partly modifications in the globalsettings.config.json file. You can't use a load-balanced name if you have created one (as per the installation guide). 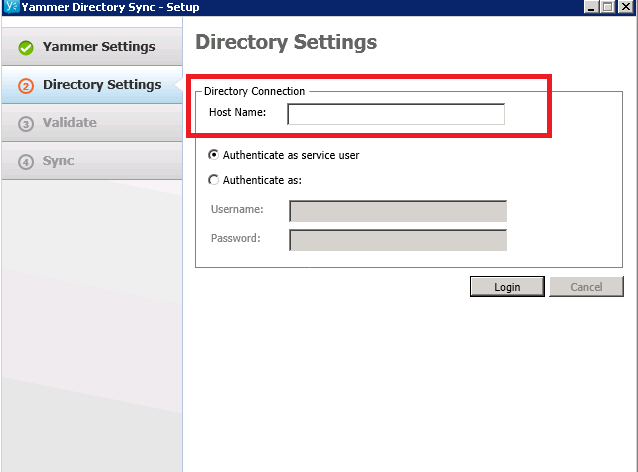 In our scenario we needed to only sync from one DC, and the issue here arises from the fact that you can't add the same hostname in the configuration screen twice. It'll just tell you it already exists in the configuration. The only ways to add the same DC again are to use the FQDN or the IP address in addition ot the NETBIOS hostname. Later on you can change that in the config files, but you have to go through the wizard first. 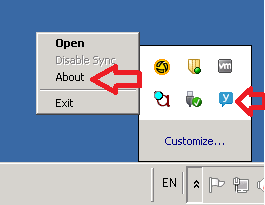 The configuration files you need then are stored in C:\ProgramData\Yammer\DirSync by default. Once you have the file open, you can implement some LDAP filters on each synchronization connection (I had to do this due to more specific requirements), but you still can't get the OU in the picture. The only way to do it is to use the "OverrideRootNamingContext" parameter which tells the sync tool which is the "root" container in the domain. So in our example, on each of the 5 synchronization connections that were created, we had to add the respective parameters. Let's say our domain name is contoso.local and we only want to sync users from the Test OU. We insert this in the first synchronization connection, and replace "Test" with the other OUs that we'd like to sync in the rest of the synchronization connections.